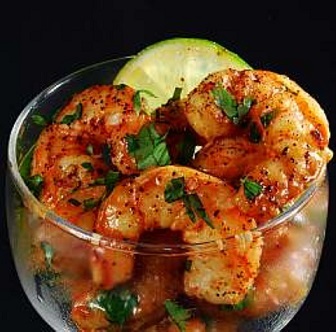 This Spicy Grilled Shrimp appetizer is a favorite restaurant recipe. My husband and I are picky about the food we offer guests (at the restaurant and at home). At a recent home get together I served this shrimp. 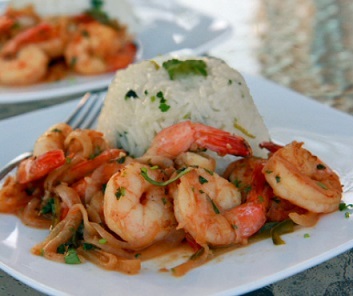 Half the shrimp were marinated in gin, the other half in tequila. Both versions were a hit. 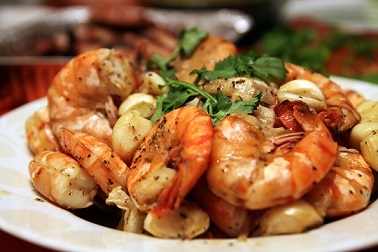 In addition, a group booked the restaurant banquet room and wanted these prawns as one of their buffet options. The person booking the party said he wanted 4 shrimp per guest since the buffet line had a lot of other delicious food choices. We did as requested but also prepared 15% more shrimp than requested. Good decision. They ate them all! You and your guests will enjoy them, too. Preparation time: 1 hour to marinade the shrimp plus 15 minutes. Serves 6. "The shrimp that falls asleep is carried by the current."